This is the second of the mission concepts I'm working on. It's more complex, in that it lets both sides put down a bunch of obstacles prior to the start of the game. Which will require appropriate terrain such as barbed wire, sandbag (or similar) walls, rocks/trees, and possibly minefield markers of some sort. 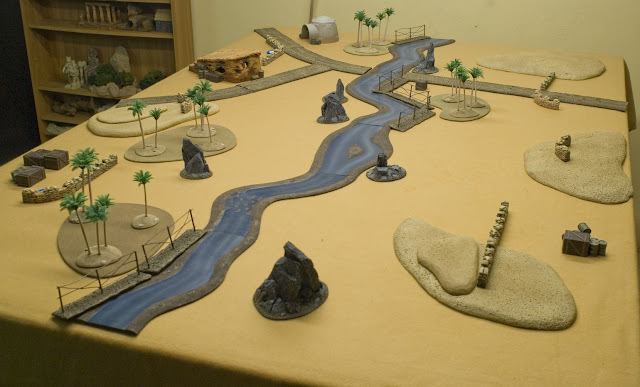 If you haven't read my concept post on player-placed terrain, go read it here first. This mission won't make much sense until you do. 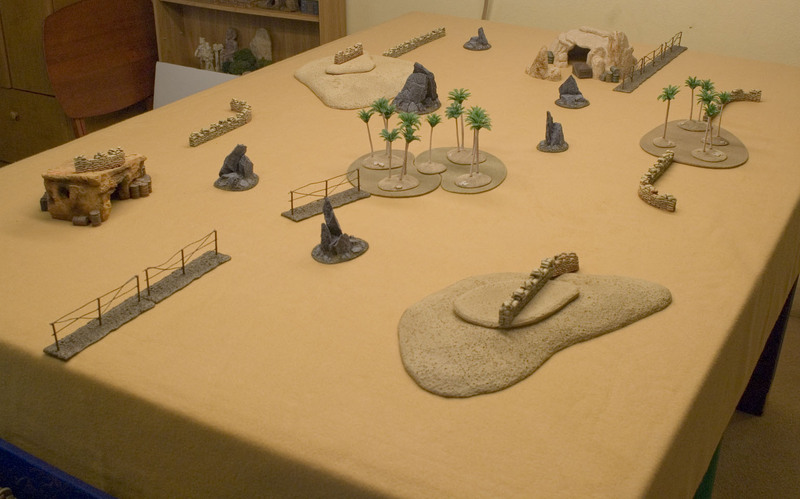 An example battlefield for this mission. The attacker has snuck in some reinforcements and is launching a surprise attack with his entire force against just half (rounded down) of the defender's force. The defender must hold his objectives long enough for his reserves to come in and turn the tide of the battle. Unlike 40K, where you always roll one die per unit in reserve, we would follow the Flames model. Where you roll one die on turn 1, two dice on turn 2, etc. For each 5+ you roll, you can bring a reserved unit on. If you roll 3 or more dice at once, you get at least one unit on no matter what. For Normal Reserves, you start rolling on turn 1. For Delayed Reserves, you start rolling on turn 3. Reserves then become a game balancing mechanism. One that allows for balanced asymmetric battles, where a few defenders have to take on a numerically superior foe. Which is something that 40K players never get to see, but damn is it fun! To balance this difference in on-table forces, the Defender gets certain advantages. Such as fortifications, obstacles, and the starting distance between the lines. They also can have Ambushes. 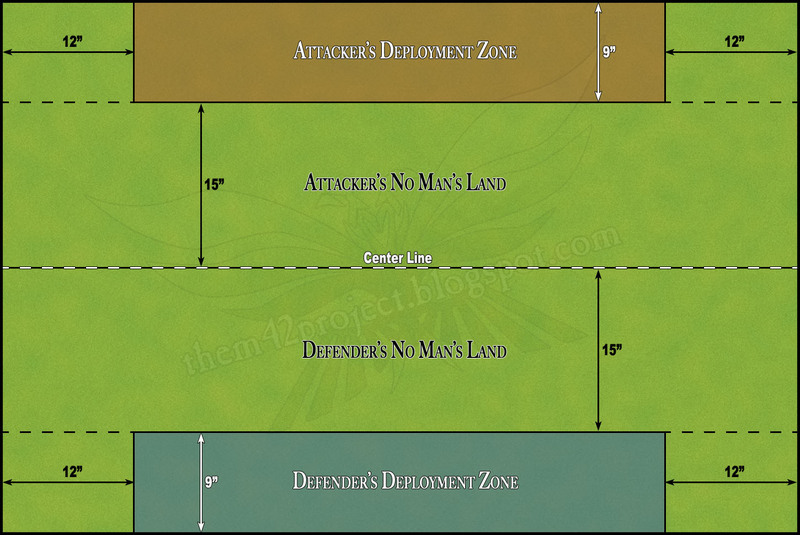 Where the Defender keeps a unit off-table and can deploy it anywhere they like (with certain restrictions) in their deployment zone at the start of any of their turns. Flames only does this with units. But we could also allow ambushes with things like minefields. Point being, the Attacker knows that some portion of his force is going to get blindsided/killed as it advances. But for a few turns at least, he has the advantage of superior numbers. So he has to get across the field and beat face before the cavalry shows up. Each Player rolls a die and the winner chooses a long table edge. The loser of the roll takes the other long edge. The winner of the roll is NOT automatically the attacker, just the first deploy-er. We won't know who the attacker is until everything has been set up. Both players now choose up to half of their units (rounded down) to be deployed. The rest will go in reserve. Two 18" lines of Pegasus Hobbies barbed wire sections. All 6 sections were $15 fully painted. 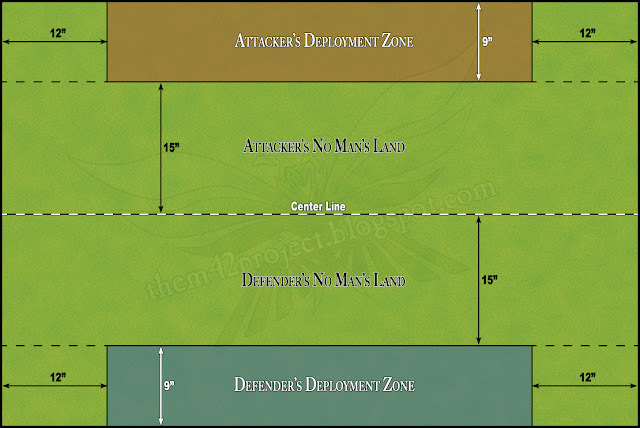 Starting with the first deploy-er, both players now place up to 18" of blocking obstacles (barbed wire) in their half of the No Man's Land between the Deployment Zones. Roughly 30" of Pegasus Hobbies Sandbags vs. a Full GW Aegis Defense Line Kit. Should be doable for most folks. Next, starting with the second deploy-er, each player will place 30" of defensive obstacles (sandbags, walls, or rubble lines) in his own deployment zone. These will protect their defensive troops. 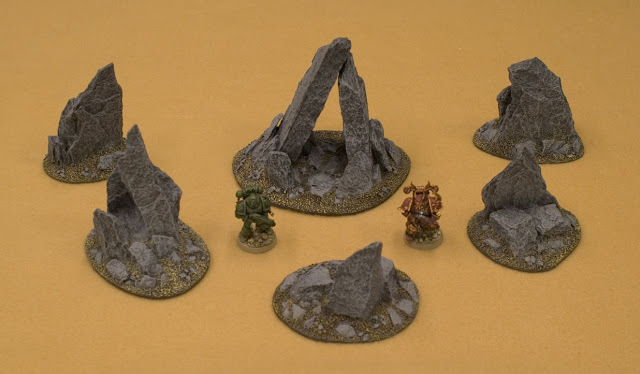 These pre-painted rocks ($25 from Battlefield in a Box) would make good point obstacles. Starting with the first deploy-er again, each player will put down 3 point obstacles (single based trees, rocks, or crate stacks) in their opponent's half of No Man's Land. This is to break up fire lines and provide cover for advancing forces. The table should now look similar to this. With lines of sandbags, barbed wire, and point obstacles placed. Finally, starting with the second deploy-er, both players now deploy the half of their units (rounded down) that they chose earlier. Once everything is placed, it's time to see who the attacker is. Both players roll a die. The winner is the Attacker, and the loser is the Defender. The Attacker may now place his reserved units within his deployment zone (Immediate Ambush). While the Defender's reserves will be delayed (not rolled until turn 3). Each player, starting with the Attacker Defender, now places one objective in the Defender's deployment zone. The Attacker's mission is to seize one of the 2 objectives in the Defender's deployment zone. Controlling either one at the beginning of his turn will win him the game. If, after turn 6, he has no unit in the opponent's half of the table, he will auto-lose the game. The Defender has to kill enough of the Attacker's units to force a Task Force Morale check. If the Attacker's officers are all dead, he will fail the check automatically and retreat. He can also win if there are no attacking unit in his half of the table after turn 6. (Edit) The Attacker may also win the mission if he can kill enough of the Defender's units to force a Task Force Morale check. If all of the Defender's officers are dead, then the Defender's Task Force will fail the check automatically and retreat. There is no turn limit to the game. You play until one side or the other meets it's objectives.